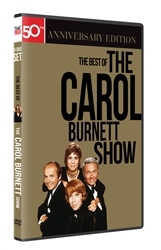 50th Anniversary Edition - The Best of the Carol Burnett Show! On September 11, 1967, Carol Burnett and her madcap cast took to the airwaves on CBS for a new variety series that combined sketch comedy, singing and dancing. Little did they know that The Carol Burnett Show would become an Emmy Award–winning program and survive the changing tastes of TV audiences to last eleven seasons. THE BEST OF THE CAROL BURNETT SHOW celebrates the 50th anniversary of this TV institution with sixteen of the best episodes from across all eleven years, all in one collection. “Mrs. Wiggins,” “Carol and Sis,” “The Oldest Man,” “The Family,” As the Stomach Turns, and a marathon of movie spoofs are back, along with some amazing bloopers. Great guest stars and lavish stage productions grace each disc. And Carol’s question-and-answer openers with the studio audiences are no less entertaining; she might offer a hug or a shout out, or flee from a rampaging gorilla after letting loose with one of her Tarzan yells. Audiences loved Carol, and she loved them! Watch any show and you’ll agree, she’s still crazy and funny after all these years. Beloved characters Stella Toddler, The Oldest Man, Mr. Tudball and Mrs. Wiggins, Mother Marcus, and Eunice and Mama Harper. The very first episode with Jim Nabors and the very last—the emotional, double-length series finale! Guest stars Ella Fitzgerald, Bernadette Peters, Liza Minnelli, Steve Lawrence, Perry Como, Rock Hudson, Burt Reynolds, James Stewart, Rita Hayworth, and many more! Exclusive bonus features including newly produced featurettes 11 Years of Laughter on The Carol Burnett Show and The End of 11 Years: Saying So Long, and a brand new interview with Carol!